High blood pressure and diabetes are known risk factors for CKD, but evidence from multiple studies indicates that there is a genetic component to the condition too. 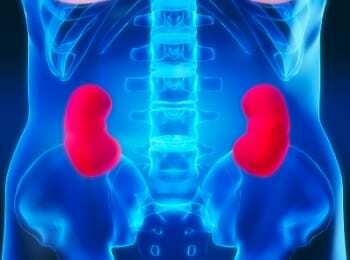 Rare mutations that cause kidney disease have been identified, but finding common variations that impact susceptibility to CKD has been difficult. Now a new study, published online this week in the journal Nature Genetics, shows that a variation in the gene that encodes the most common protein found in urine is associated with kidney disease risk. The Tamm-Horsfall protein, encoded by the UMOD gene, was discovered almost 60 years ago, but its role in the body continues to baffle scientists. Some studies have suggested it may be involved in protection against inflammation and infection, while others have suggested it functions in kidney development. Researchers found that each G at ths SNP in the UMOD gene decreased the odds of CKD by 24%. Approximately 18% of people with European ancestry have at least one G at this SNP. “We have known for a long time that a higher level of proteins, such as albumin, which aren’t usually present in urine, is a risk factor for kidney disease and its progression. The UMOD finding suggests that Tamm-Horsfall protein, which is thought to be a normal part of the urine, deserves attention since its genetic variation relates to risk,” said Josef Coresh, professor in the Johns Hopkins Bloomberg School of Public Health’s Department of Epidemiology and Biostatistics and a co-author of the study, in a statement. Another study from Johns Hopkins, appearing last year in Nature Genetics, found an association between variations in the MYH9 gene and end-stage renal disease in African Americans.